The very first skill we will discuss is teaching your child how important their presence is. It can make a difference on being singled out as a possible victim as opposed to projecting an image of confidence, which results in being less vulnerable. What do we mean when say “Presence”? By “Presence” we mean the way your child carries themselves & their appearance. As parents, it is our responsibility to make sure our children are bathed and wearing clothes that are appropriate for school, and that is not going to be the target for other kids to be picked on. Now, I’m not suggesting buying brand name clothes or spending above your means, but if your child insists on not wearing a clothing item to school because he doesn’t think “it’s cool” or says “it’s ugly”, maybe have an open mind about why he may be communicating this to you and do not insist on forcing him or her to wear it. Another important factor in your child’s presence is the way they carry themselves and how they interact with their peers and adults. One of the factors we put a lot of emphasis on in our martial arts classes is teaching children how to properly make eye contact. When being spoken to or while speaking to their peers and adults, we always want them to make eye contact with the person they are communicating with. Even when just simply walking the halls at school, we teach our martial arts students do not have their head down but to walk in an upright position looking straight ahead because it is a known fact that bullies look for kids that are carrying themselves as potential victims and target them to be picked on. One thing we encourage parents to do to make their children get used to interacting with others is to have them speak for themselves; for example when out at a restaurant instead of ordering food on your child’s behalf, have him or her order their own food, and teach them that it is polite to look people in the eyes when addressing them. Especially if you know your child has more difficulties than their friends interacting with peers and adults, this is a great practice for their social skills development. Our second tip might seem like an obvious one and yet goes against people’s general perception of martial arts; It simply is avoidance of bullies and of situations that might create a confrontation. We instruct our students to walk away from bullies, go a different route to avoid them, whatever it takes to not have to engage them. People often think martial arts is about fighting, but it absolutely is not; it is about teaching confidence. Yes, there are obvious benefits to knowing how to defend yourself if the situation escalates, but the ability to do so results in the initial confidence that is needed to get out of the situation involving a bully. Bullies do not pick on confident children. The third skill we empower our martial arts students with is by teaching them Verbal Skills. This is a fundamental concept! Unfortunately, bullies have always existed and will continue to exist, however knowing how your child can communicate with someone picking on them without becoming a victim or escalating the situation into confrontation is very important. Bullies may initiate the relationship by picking on your child’s clothes, weight or anything they see as a vulnerability. • How to make friends with the person picking on you (Turn a bully into a friend). In the unfortunate situation a physical confrontation may arise, your child will need to know how to defend themselves. Taking martial classes will give them these self-defense skills, however, we also teach some blocking stances that communicate visually to any adults or teachers watching that they are not initiating the fight, but rather just trying to defend themselves. This will send a signal that your child is not looking for trouble, while also defending themselves from an assault. I hope you enjoyed these quick 4 tips to empower your child against bullies. If assaulted, communicate visually that you are being attacked while using simple blocks. Just telling your child to ask bullies to leave them alone is easier said than done, especially when confronted by a bigger kid. 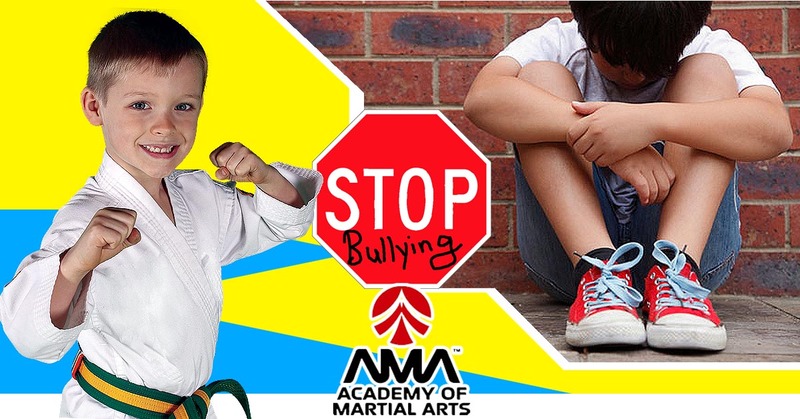 Martial arts classes BULLY PROOF kids by giving them the skills to deal with tough situations. Give your child the gift of a lifetime! When I was a child, martial arts changed my life and I am confident it can do the same for your child and your family. Remember... We teach the same values you teach at home! I hope your child has an excellent fall season and I will see you in class!